Knowledge of 6-2 and 5-1 Systems: In Divisions 1 through 6, your teammates will probably expect that you have knowledge of the 6-2 and 5-1 offense systems. For Divisions 7 and 8, your teammates will probably expect that you know the difference between different roles on the court (hitter, setter, etc.). In Division 9, 10 and PowerPlay, your teammates will only expect that you’re new and ready to have fun playing volleyball! Help! I’m new to Gotham! What level should I try out for? If you are New to the Game: Divisions 10 and PowerPlay (info below) are the divisions that take most new members who have little to no volleyball experience. Sometimes, those new to the game are selected for Division 9 and rarely, but occasionally, for Division 8. We strongly encourage those new to the game not to try out for any division more advanced than Division 8. 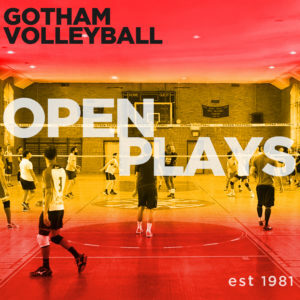 We encourage those with no prior volleyball experience to attend tryouts for Divisions 9, 10 and PowerPlay and to register for at least Division 10 and PowerPlay. If you are NAGVA or USAV rated, or know where you’d fit in their rating system: follow the guidelines above. NAGVA rates everyone as at least Level B player. If you are a B-rated player, but have just done NAGVA for fun in the past and are not really competitive in B-level tournaments, you should start out trying for Division 7 or lower. If you have previous volleyball experience playing at a college level (NCAA and NCVF): you should try out for Division 1 and 2. This applies to competitive inter-collegiate volleyball. This does not include college intramural competition, where the levels vary widely. If you have played very competitive intramural volleyball or high levels of other adult amateur leagues: You should consider Division 4 or above, depending on the level of competition in your other volleyball experience. For example, if you play in other local adult recreational leagues and play in a Men or Women’s Only Level 1 or 2, you will fit somewhere in Divisions 1 through 3. If you play in Men/Women’s 3 or 4, you will fit in Divisions 3 through 5. If you have played intramural volleyball or middle to low co-ed levels in other local adult amateur or recreational leagues: You should consider Divisions 5 through 10 depending on your prior level of play. If you played at beginner/advanced beginner levels in other leagues, or just for fun intramural volleyball, you should try out for Division 8 or lower. If you played at intermediate levels, you should consider Divisions 5 through 8. These are not hard and fast rules, just guidelines. Feel free to try out for whatever divisions you are comfortable with, with one exception, only try out for Division 6 or above if you have previous volleyball experience and are knowledgeable of volleyball systems of play. The 6-2 system is used during tryouts for Division 6 and above. If you have any questions, please contact [email protected]. When in doubt, try out for as many divisions that you feel comfortable playing in. The more you try out for, the more you are likely to get selected for a team!